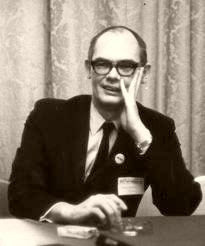 "Frederik Pohl, grandmaster of science fiction, dies aged 93"
"Frederik Pohl, Worldly-Wise Master of Science Fiction, Dies at 93"
Frederik Pohl, whose passion for science fiction while growing up in Brooklyn led to a distinguished career as one of its most literate and politically sophisticated practitioners, though one who was skeptical about attempts to perfect society through scientific means, died on Monday at a hospital near his home in Palatine, Ill. He was 93. His agent, Mitchell Waters, who confirmed the death, said Mr. Pohl was taken to the hospital in acute respiratory distress. Palatine is northwest of Chicago. Mr. Pohl was involved in publishing science fiction since he was a teenager, when he served as a literary agent for his science fiction-writing young friends. He went on to edit magazines and books before finding renown as a writer, often with collaborators. Perhaps the most famous of his anti-utopian novels was “The Space Merchants,” a prescient satire that Mr. Pohl wrote in the early 1950s with Cyril M. Kornbluth. More than a decade before the surgeon general’s report on smoking and health, the authors imagined a future dominated by advertising executives, who compete to hook consumers on interlocking chains of addictive products. One such chain is started by a few mouthfuls of Crunchies. “The Space Merchants” has been translated into more than 25 languages and has sold millions of copies worldwide. Mr. Pohl’s grasp of science was impressive; although entirely self-taught, he was elected a fellow of the American Association for the Advancement of Science in 1982. He was also in demand as a so-called futurist, speaking to business executives and other audiences about the shape of things to come in a science-dominated future — and about the unreliability of even short-range predictions. His view of a high-tech tomorrow was always darkened by doubts about the social consequences of scientific advances. In his grim 1979 novel “Jem: The Making of a Utopia,” high-minded colonists to a distant planet end up making the same mistakes that have already doomed civilization on Earth. The novel won a National Book Award (then known as the American Book Award) in 1980, the only year either award had a science fiction category. Mr. Pohl was born in New York City on Nov. 26, 1919, and spent most of his childhood in Brooklyn. An early reader, he developed a taste for the science fiction magazines of the day, known as pulps for their poor-quality paper. His love of books encompassed everything from Tolstoy to the French Symbolists, but did not carry over to formal education; he dropped out of high school at 17 — “as soon as it was legal,” he said. Mr. Pohl’s ambition, like that of his friends, was to be a professional writer. Toward this end he became a literary agent and an editor, both before his 20th birthday. As an agent he represented the work of his friends to the established science fiction magazines; he also published many of their stories, and some of his own, in two new pulp magazines, Astonishing Stories and Super Science Stories, which he edited from 1940 through the summer of 1941. After serving as an Army weatherman in Italy during World War II, he wrote advertising copy for a mail order publisher. Then he became a literary agent again. In the late 1940s science fiction was becoming respectable, and Mr. Pohl helped connect science fiction writers to mainstream publishers; he sold Mr. Asimov’s first novel, “Pebble in the Sky” (1950), to Doubleday. At the same time, he was writing prolifically, often in collaboration with Mr. Kornbluth. “The Space Merchants” was the most successful of the 11 books they wrote together. In 1960 the British novelist Kingsley Amis hailed Mr. Pohl as science fiction’s “most consistently able writer.” The next year Mr. Pohl began editing two magazines: Galaxy, the monthly that had serialized “The Space Merchants,” and If, in which he introduced a number of important new writers, including Larry Niven and Alexei Panshin. Under his leadership If won the Hugo — an award voted by science fiction fans — for best magazine in 1966, 1967 and 1968. After 1969, Mr. Pohl devoted most of his energies to writing. Yet he also found time to serve as science fiction editor at Bantam Books in the mid-’70s. It was a period of creative turmoil in science fiction, when a group of writers known as the New Wave sought to elevate genre writing by emphasizing literary style and character development. At Mr. Pohl’s urging, Bantam published two of the most important science fiction books of the era: “The Female Man,” by Joanna Russ, a feminist novel in which the war between the sexes is fought with real bullets; and “Dhalgren,” by Samuel R. Delany, a vast experimental work that owed as much to James Joyce as to H. G. Wells. Despite initial resistance from the Bantam sales force, “Dhalgren” went on to sell more than a million copies. The ’70s also saw the blossoming of Mr. Pohl’s own writing career. In 1976 he won his first Nebula Award (given by the Science Fiction Writers of America) for “Man Plus,” about an astronaut whose body is surgically altered for life on Mars. He won another Nebula in 1977 (and a Hugo in 1978) for “Gateway,” which he considered his best novel. It told the story of a man who gains a fortune but loses the love of his life on a “prospecting” expedition aboard an alien spaceship — one of many left behind by the mysterious Heechee, who have taken refuge from even more mysterious aliens inside a black hole. Its most memorable character was a robot psychiatrist who tries to help the hero come to terms with his survivor guilt. Mr. Pohl wrote four more novels and a book of short stories in the Heechee saga. Mr. Pohl was married five times and had four children; his third wife was the noted science fiction writer and editor Judith Merril. Information on survivors was not immediately available. Mr. Pohl was a tireless researcher. In 2000 he published “Chasing Science: Science as a Spectator Sport,” which recounted his travels to learn about science firsthand, including visiting a neutrino detector in an abandoned gold mine in South Dakota and Star City, near Moscow, where Russian cosmonauts live and train. When he did make a scientific mistake, he felt compelled to correct it. In the final novel in the Heechee saga, “The Boy Who Would Live Forever” (2004), he apologized to readers for his original decision to have the aliens hide in a black hole. While this had seemed an acceptable plot device back in the 1970s, when black holes were “quite a novelty,” he wrote, scientists in the 21st century no longer believe that “organized matter of any kind” can exist inside a black hole. Accordingly, he asked his readers to treat this central element in the galaxy-spanning saga as mere fantasy.